1. The Three demensional mixer machine can perform a very uniform mixing of power or granule materials with a good mobility. 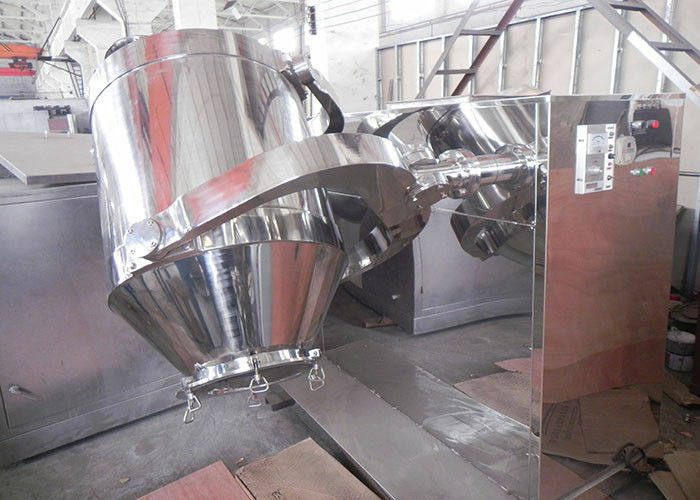 Because the mixing tank rotates in multiple directions, there is no centrifugal force acting on the material, as well as no phenomena of gravity segregation, delamination and accumulation of materials so the mixing rate can be up to 99.9%.Therefore, it is an ideal product currently compared with other various mixers. 2. The three demensional mixer tank has high loading rate max.80% , so that its mixing efficient is high and short mixing time. 3. The barrel transitional radius everywhere, and also has been polished ,which has achieved GMP quality standards. This machine is composed of base, governor motor shaft, rotary connecting rod and barrel etc., material barrel is driven by the positive shaft to make complex movement including horizontal move, rotation and roiling etc, which makes the material moved to 3 directions along the barrel, therefore, highly uniform mixing of various material is realized. This machine is a kind of full closed high efficient energy saving mixer without germ and dust. When he material is being mixed, no centrifugal force effect and situation of gravity segregation and laminar accumulation are occurred. In addition, it has larger loading capacity, short mixing time and high efficiency. general mixer is 40% of full barrel volume, and the maximum charging rate can be up to 90%. 3. The materials are mixed under the airtight space; it would not pollute the environment. Attention: If you are not satisfied, don't be disappointed. The images and parameters are not comprehensive at the webpage. You can tell us your request and we will recommend one to you. And also customizable, our engineer can exclusively design for you. All machineries from Jiangyin Hallo are made by ourselves, with lower price, good quality and assured full after service. 1. We provide you with the prophase plan, process flow design and manufacture equipment according to your special demand. 3. We always keep certain inventory level of spare parts, which means the replacements can be shipped to you right away. Many thanks for your trust; we can provide you with design scheme for complete production lines, spot inspection and operator training according to your demands and the conditions of applied spot, we can help you choose the right equipments. 4. We’d like to recommend a suitable model for you and send you a best quotation. So please give us some more information about your requirement in your enquiry. ♥ What is the type and size of raw material? ♥ What is your required capacity per batch? After sales service process will start once our clients receive the goods. Hallo had established the after-sales service management system to ensure its service is perfectly provided, Hallo efficiently supervise and manage the whole after-service system. The warranty is 1 year. After clients receive the goods, we will provide with parts for the damaged components (excluding the damages caused by wrong operation) for free. We will deliver the necessary parts through TNT, by air or by sea free of charge within one year. Hallo is able to provide you with the overall installation of complicated machinery, or customized equipment, or complete production line. After installation, we will make inspection of the whole machine, operate equipment, and provide you with testing reports of installation and operation. Hallo provides operation manual (English version) to instruct you how to install and maintain. If clients have any technical questions, we will provide phone call instruction, e-mail communication timely. Hallo is dedicated to provide our clients with genuine spare parts with the highest quality, appropriate function. The clients submit spare parts request to us, ad list products name, model, equipment serial number, description of required parts. We guarantee that your request will be handled quickly and appropriately. Our clients can install the machine according to manual boom provided by Hallo, or before delivery, clients can come to our factory during the commissioning period and have training from us about how to operate and maintain the equipment.